Argentina's air force tests and develops "bio-jetfuel"
Not long ago, we reported about progress made in the development of biofuels for airplanes, the last great green fuel challenge, and today, Argentina's Air Force not only announced its plan to develop "biokerosene", but actually demonstrated its use. The plan foresees a "bio-jetfuel" containing 80% "Jet A1", a special kind of kerosene, and 20% biodiesel obtained from soy or rapeseed. A first actual demonstration of a military aircraft - a C-130 Hercules - using the new fuel was given today at a military base near Buenos Aires. The test showed that the turbines of the Hercules operated equally well with the new "bio-jetfuel" as with "JP1", the fuel it normally uses and which also powers civilian airplanes. 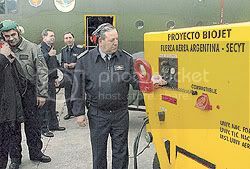 Eduardo Selles, chief engineer of the Departamento de Innovación Tecnológica de la Fuerza Aérea Argentina: "Argentina is pioneering the development of this biofuel and so far we are the only air force to have ever used this mix of biodiesel and JetA1." Selles adds that the biofuel delivers the same power to the turbines as the traditional fuel and that it requires no modifications of the aircraft engines. Today's test was a ground test but the Argentinian airforce, together with its technical partners of the Universidad Tecnológica Nacional and the Universidad Nacional de Formosa, plans a full flight with the new fuel early next year. As we reported earlier, in april of this year, Argentina implemented its 'Ley de Biocombustibles' which aims at a production of 800,000 tons of biofuels per year by the year 2010.